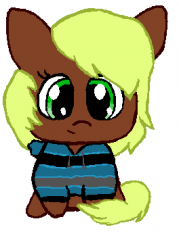 Derpy Hooves (Pony265) Has hosted a muffin party! All ponies welcome! 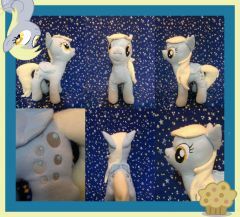 Derpy has rules: 1. Don't steal a muffin from another pony. 2. Don't steal a muffin from another creature. 3. Don't steal a muffin from another reformed villian. Oopsie. It appears I made a scribble. I honestly have no logical explanation for why there's a rose(?) instead of a wax seal on the envelop. I just wanted to paint some petals. Derpy was curled up in her recliner with her chin resting on the arm. She gazed out the window and absent mindedly chewed on a strand of her hair. No mail delivery for her today since it was the weekend. And it was quite evident that she was bored as a barrel. She already made the weekly batch of muffins so what else did she have to do? 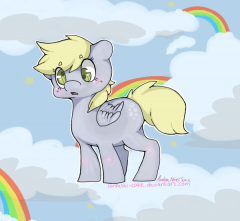 Derpy observed a unicorn trotting by and wondered what it would be like to have magic at her disposal. But she wouldn't wanna trade her wings for that. It was be far too weird to loose the ability to fly at this point. Not to mention dangerous thanks to her being such a ditzy doofus all the time. She'd end up forgetting her wings were gone and getting into all kinds of trouble as a result. But why couldn't she have both? Her eyes landed on a pile of crafts on the floor and she stared at them for a moment before looking at the basket of muffins on the counter. The wheels in her head were turning until an idea finally graced her thinker. She gasped at the sheer brilliance and bolted form the chair. After some work, she was done with her setup. A booth sat near her house advertising magical princess muffins. A line of muffins sat atop the table sporting different colored paper horns and wings. Costume supplies were everywhere as well as an assortment of paint and glitter. 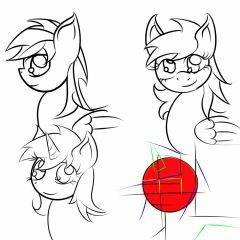 Derpy decided this silly little idea might help liven up the day if she was lucky. Though she painted the words "buy" on the sign, she didn't really intend to charge for the muffins. The citizens did get them for free on a weekly basis after all. It just sounded good at the time. "Ever wanted to be a princess? Well now you can! 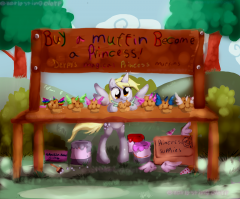 Welcome to Derpy's magical muffin booth! Buy a muffin, become a princess! And you don't buy with bits. 'What do I buy it with then?' you ask with a hint of childlike wonder in your voice. Well, my sweet little inquirer. You buy with tips. That's right, tips! Life tips that is. Don't be a greedy goober. Share some of that unfailing wisdom with others!" Buy a muffin, become a princess! Buy a muffin, get a custom princess costume for free! 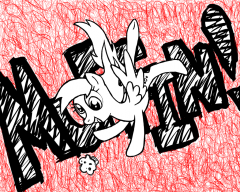 (made of paper and party hats) I drew this for my upcoming Derpy thread. It started out as a doodle but I got carried away. I'm getting a lot more comfortable with the shading technique I've been working on. It's still needs work but I'm pretty surprised by how quickly I'm improving. 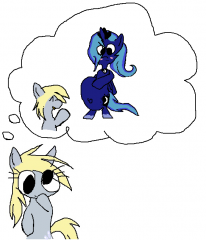 "Derpy dreams of breaking the news that Princess Luna is pregnant"
Derpy, our most beloved postal pony. Is thier nothing we can do? nothing that can be said? Will You Be My Muffin? Derpy here (yeah I call her Derpy but I am not all picky about the name personally) just being all cute. 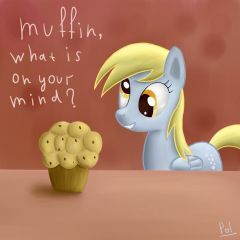 Looks like she would share her basket of muffins with a special muffin, er pony. Why socks? Extra dorky cuteness and I like socks. I'm sure all of you have seen these toons before. They're rather well made. 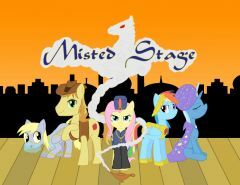 Original animation with a voice cast staring the good pony Doctor and his sidekick. They just finished an second episode and it's probably one of the better original toons made by fans I've seen so far..
Is derpy the evolution of grr? 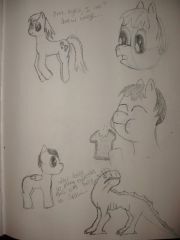 Finally finished my drawing of Derpy Hooves! Please, tell me what you think!